Can you identify any of the children in this photograph? 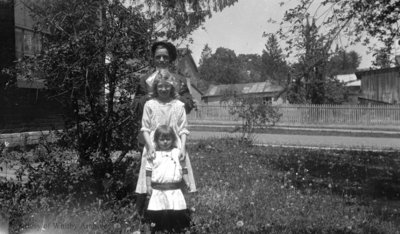 A black and white medium format negative of three unidentified children standing in a line outside. They are arranged from tallest to smallest, with one boy at the back and two girls, in the middle and in the front. This negative has started to degrade. Three Children Standing Outside, c.1915, Photographer Unknown. Whitby Archives A2014_001_039.